Having been building steam engines as far back as the 1880’s and primarily for powering fairground rides, Showman’s completely revolutionised the way rides were driven. Previously these rides required horses to power them, which was obviously more labour-intensive and would provide a limitation on the sizes of the rides. Usually distinguishable from other road-going steam locomotives of the time due to being painted in bright colours and using brass decorations, Showman’s were always good on the eye. This is just one of the reasons why models of these fabulous automobiles are always sought after by collectors. 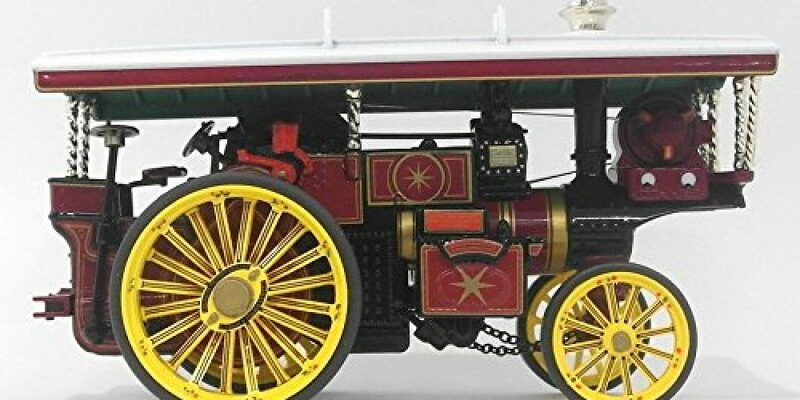 This is a highly detailed die-cast model of one of Burrell Showman’s, creators of some of the earliest steam locomotives, most beautiful models. Initially built in 1912, the Philadelphia No 3413 has quite a story attached to it. Originally used by its first owner, a certain Joseph Smith, to operate a fun fair ride in Southampton, it was later sold by his family after his death to Alfred James Bartlett. Put back to use at powering funfair rides, the 3418 was eventually requisitioned for involvement in the second world war. Used in agriculture during the war and up until 1948, it was eventually left in a shed for almost 50 years. John and Brenda Newton who now own the Philadelphia first tried to purchase the Philadelphia in 1966 but after many years of negotiations, the sale only went through more than thirty years later in 1999. 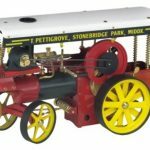 With a scale of 1:50 and made from a die-cast material, collectors and model enthusiasts will be getting a highly detailed model of the Burrell Showman’s Philadelphia No 3413 Steam Vehicle. The Corgi Burrell Showman’s Philadelphia 3413 is certainly not a model for children and is primarily for hardened adult collectors. 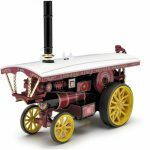 A piece of history, a fascinating story and a truly beautiful model, the Burrell Showman’s Philadelphia No 3413 Steam Vehicle Model is one that most collectors will want in their collections. Die-cast and with extremely high detail, a model such as this will prove to be a fantastic addition to any collection.. 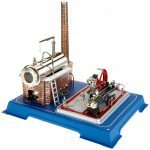 Furthermore, built to be sturdy and to last, this model can be displayed with the peace of mind that it can withstand a bit of use here and there with the right care and attention. Anyone that has not added this particular model to their collection as of yet, should seriously consider doing so as it really is a gorgeous piece.